With the end of the year only a week away, people are getting ready to start their New Year's Resolutions. I can't remember my resolutions for 2016, and a quick search of my blog shows that I didn't write any down. But, one of the things I did work on this year was reducing my food waste. This meant that I no longer eat meat in my apartment. Why? Because I often let meat go bad while I figured out how I wanted to cook it. I made it easy for myself and just got rid of it all together. Here are some ways I will continue the trend of reducing my food waste, while also getting healthier. Buy Ugly Produce: While I am throwing away less food, I can still do more to cut down on food waste. So in 2017, I am going to start purchasing ugly produce. What's ugly produce you ask? It's produce that, while it taste the same, doesn't look pretty enough to sell. Often times, it's thrown away, but there are companies that work with farmers to sell them, such as Hungry Harvest and Imperfect Produce. So, this year, half of my produce will be ugly. Eat More Fruits and Veggies: Along with buying ugly produce, I also plan to eat more fruits and vegetables, in general. This is one of the weakest parts of my diet. It's not because I don't enjoy produce, but mainly because I can't find places to eat them outside of a smoothie. So, I've been pinning lots of recipes that include fruit or vegetables as part of the main course. Take an iron supplement: I'm pretty good with taking a multi-vitamin, but forever (at least since I can remember), I'm supposed to take an iron supplement. I often forget, but this year, I want to make it a priority. I've been diagnosed with anemia since 16, so taking iron will help with that. Getting iron to optimum levels also helps manage the immune system, improves energy levels, and benefits hair, skin, and nails. 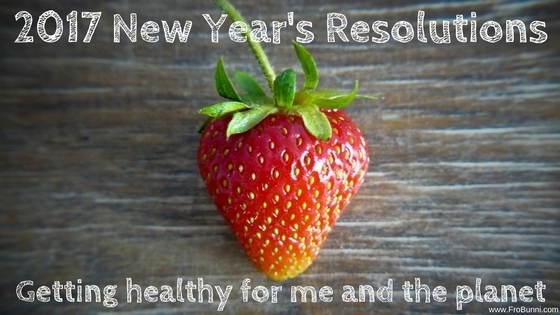 My resolutions this year are pretty attainable, but what's even better is they will not only better my health, but also better the world.